Add an ethnic touch and the fabulous look to your room with this beautiful idol of Goddess Laxmi. With an antique silver finish, this decor piece has the potential to create a marvelous standalone focal point for any mantle surface, or can also be placed in your mandir.Easy to maintain. Add an ethnic touch and the fabulous look to your room with this beautiful idol of Goddess Laxmi. 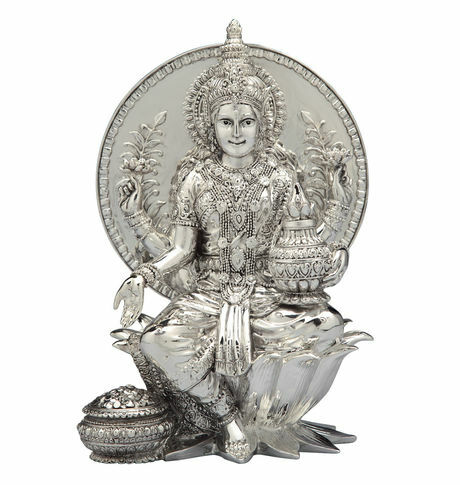 With an antique silver finish, this decor piece has the potential to create a marvelous standalone focal point for any mantle surface, or can also be placed in your mandir.Easy to maintain.Cancellation and Return Policy: • Exchange allowed post booking • No order cancellation or Refund transaction allowed at the store.